A walk in enrolment day is to be held Friday February 2nd. If you are in our school zone. You are welcome to come into the school office from 8.30am to 3.30pm. Please download an enrolment form and bring in all documentation require. First come, first served. Children may begin school on their fifth birthday but must, by law, be enrolled by their sixth birthday. Please supply verification of; residence (bill or other document supporting your address), date of birth (birth certificate or passport) along with your child’s immunisation certificate. If you do not have an immunisation certificate for your child, or would like further information about immunisation, talk to your doctor or nurse. It is best to ring to make an enrolment visit for your child, about 6 weeks before their 5th birthday. It is then possible to arrange suitable days for your child to visit, both with Mum and/or Dad, and on their own. This makes school familiar and easier to cope with on their first day. Children entering the school from other schools within New Zealand need to complete an enrolment form. The school will then request a transfer of records. Hurupaki Primary School is currently a zoned school. 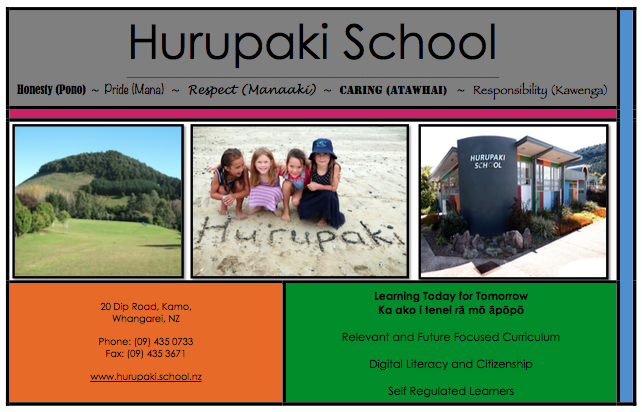 The Ministry of Education has put in place an enrolment scheme, which means only children living within the zone are entitled to attend Hurupaki School. Children living within the zone are automatically granted a place at the school. For zone information visit link below or call into the office for information. Out of Zone applications happen the year previous to your child starting school. We generally advertise in the Northern Advocate each year in September/October. Please feel free to call or email the office anytime however, to put your child on our list. Please note: If you are in zone at time of enrolment and move out of zone after enrolment, you must notify the school immediately. 1. Siblings of current students. 2. Siblings of former students. 3. Children of former students. 4. Children of Board employees or Board members.